On February 5, Jason Eisle was arrested by the Momence Police Department for Possession of Drug Paraphernalia. On February 6, Ryan Newberry was arrested by the Momence Police Department for Driving While License Revoked. On February 8, Victoria Craft was arrested by the Momence Police Department for Driving With No Valid Driverâ€™ License. On February 9, Marc Hoy was arrested by the Momence Police Department for Domestic Battery and Possession of Cannabis. On February 10, Cheyenne Jones was arrested by the Momence Police Department for Possession of Drug Paraphernalia. On February 11, Julio Vega-Ruiz was arrested by the Momence Police Department for Driving With No Valid Driverâ€™s License. On February 11, Haley Becker was arrested by the Momence Police Department for Possession of Drug Paraphernalia. On January 11, Brant Pastore and Tyler Wanamaker were arrested by the Momence Police Department for Possession of Liquor on a Public Way. On February 12, Lisa Neuman was arrested by the Momence Police Department for Driving While License Suspended. On February 12, Jose Andrada-Vargase was arrested by the Momence Police Department for Obstructing Identification, a Kankakee County Warrant, and Possession of Cannabis. On February 19, Matthew Vincent was arrested by the Momence Police Department for Driving While License Suspended, Possession of Drug Paraphernalia, and Possession of Cannabis. On February 20, Jesus Acosta was arrested by the Momence Police Department for Driving With No Valid Driverâ€™s License. On February 20, Robert Boyd was arrested by the Momence Police Department for a Warrant. On February 21, Tyler Morrow was arrested by the Momence Police Department for Possession of Drug Paraphernalia. On February 22, Adelmira Castillo was arrested by the Momence Police Department for Driving With No Valid Driverâ€™s License and Obstructing Identification. On February 28, Randall Scroggins was arrested by the Momence Police Department for Driving While License Suspended. All parties are presumed innocent unless convicted by a court of law. 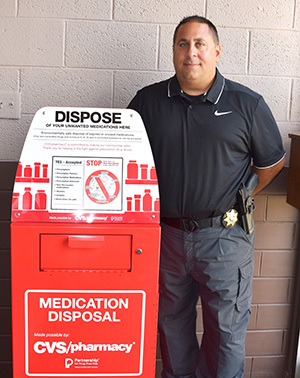 The Momence Police Department just received a Prescription Drop Off Box Grant from CVS. This grant allows the residents of Momence to drop off all old prescriptions safely and securely. The box is located in the foyer of the P.D.